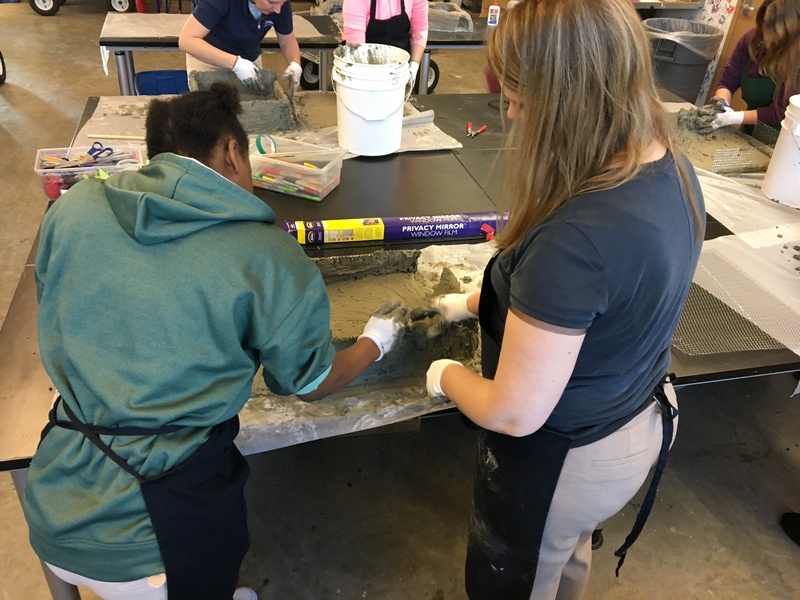 Four teenaged girls recently assisted the Detroit Zoological Society (DZS) with our amphibian conservation efforts by pairing up with staff members to build mudpuppy shelters at the Detroit Zoo’s Ford Education Center. These young ladies were from Oakland County’s Children’s Village, a residential treatment and detention center for youth. The DZS began a partnership with Children’s Village in 2009 to instill respect and reverence for wildlife and wild places within the hearts of these teenagers. The program expanded in 2016 to offer off-site community service opportunities for the residents. 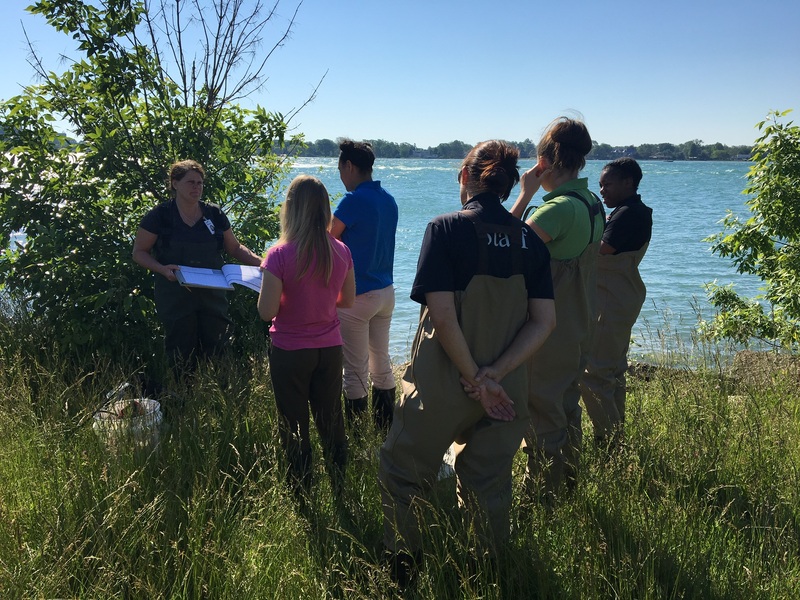 Mudpuppy shelters are an important piece of our ongoing conservation work as we monitor the population of these aquatic amphibians on the shorelines of the Detroit River and the inland lakes of Belle Isle. Mudpuppies are indicators of water quality; they cannot survive in polluted or contaminated water, so their presence is a sign of a healthy aquatic ecosystem. DZS amphibian staff provided the specifications for the height, width and depth of these cement structures, as well as the materials to make them. The young ladies worked in pairs with DZS staff members, donning thick gloves and using wire cutters to trim heavy-duty wire mesh, before folding and binding it to form the bottom of the shelter. They then layered the cement over the wire mesh and built it into a solid, smooth floor and walls. Separate pieces of wire mesh were then cut to size and layered with the cement mixture to create roofs for the shelter. Once the weather warms up, the shelters will be placed in the water around Belle Isle in hopes that mudpuppies will find them a desirable place to lay their eggs. They tend to lay their eggs under rocks in their natural habitat, which makes it difficult for researchers to locate the eggs without potentially disturbing them by having to move rocks. 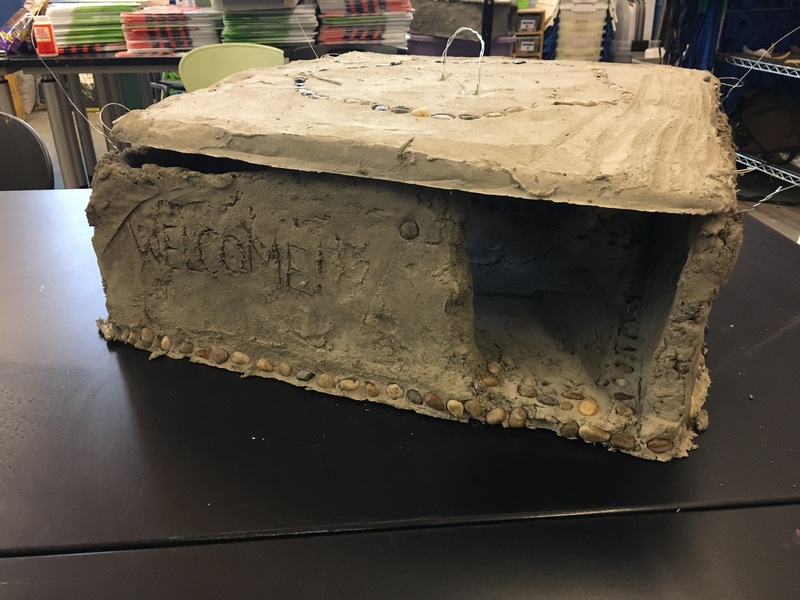 With the easy-to-remove roof on these homemade shelters, mudpuppies could lay their eggs inside and DZS staff would be able to lift the top and easily check on the eggs without disturbing them. The young ladies who helped build the shelters will join us down on Belle Isle in the coming weeks to place them in the water. They will have the opportunity to work alongside DZS amphibian and education staff to record weather, water quality and shelter placement as well as check on previously placed shelters. These teens are facing many challenges in their lives and working alongside scientists in the field offers them the chance to explore careers they may not have otherwise known about or considered. It is an opportunity for them to try a new experience, build skills and understanding, and give back to the community through conservation. Animal Welfare: What’s Heat Got to Do With it? 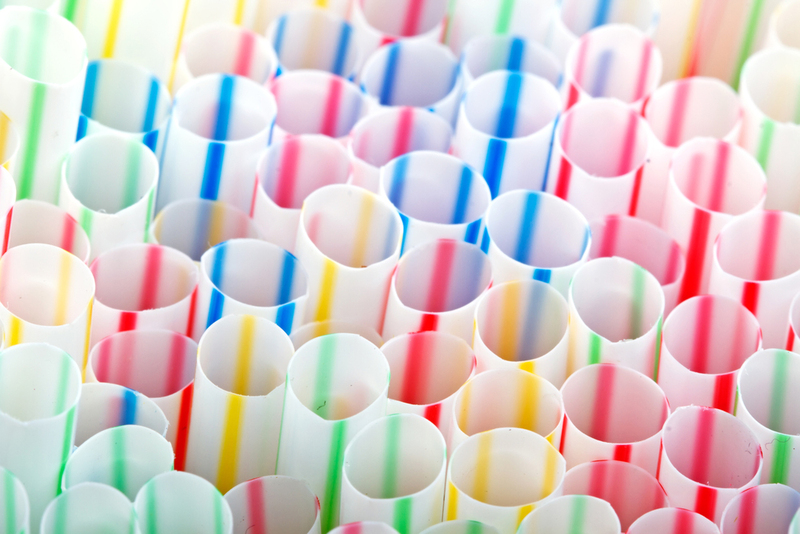 Have you ever been so worked up about something that it “made your blood boil” or told someone they should “chill out”? We often equate emotions with temperature and the English language has a number of idioms that reflect this association. As it turns out, there is a real and biologically based reason for this. As we experience some emotions, our bodies undergo a number of processes, including changes in our temperature. This is the case for other species as well, and research has shown that particular emotions can be assessed using temperature fluctuations. Finding new ways to evaluate the emotional lives of animals is a critical part of advancing our understanding of animal welfare. It is also incredibly important that we develop methods that are non-invasive, thereby not affecting the animals as we assess their well-being. 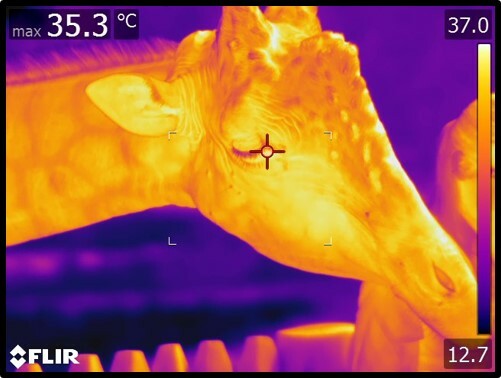 Infrared thermography is a potential way for us to do just this, and staff at the Center for Zoo and Aquarium Animal Welfare and Ethics (CZAAWE) is working on new ways to apply it at the Detroit Zoo. Infrared thermography (IRT) is a type of technology that allows us to remotely measure the temperature of an object using a camera. The images, called thermograms, show different colors to represent temperatures and this allows us to take measurements without having to touch the object. In recent years, the impact of interactions and relationships with humans on the welfare of animals has begun to receive more attention. As animals living in zoos invariably encounter and interact with humans on a variety of levels, it is crucial that we understand how these relationships affect animal welfare. In some cases, it may be easy to assess how an animal is reacting, but in others, we have to use means that are more scientific. CZAAWE has developed a number of projects to examine human-animal relationships using several methods, including IRT. There are several types of experiences during which visitors can interact with an animal at the Detroit Zoo. These encounters are entirely voluntary, as the animals (and the visitors) can choose whether they want to participate. 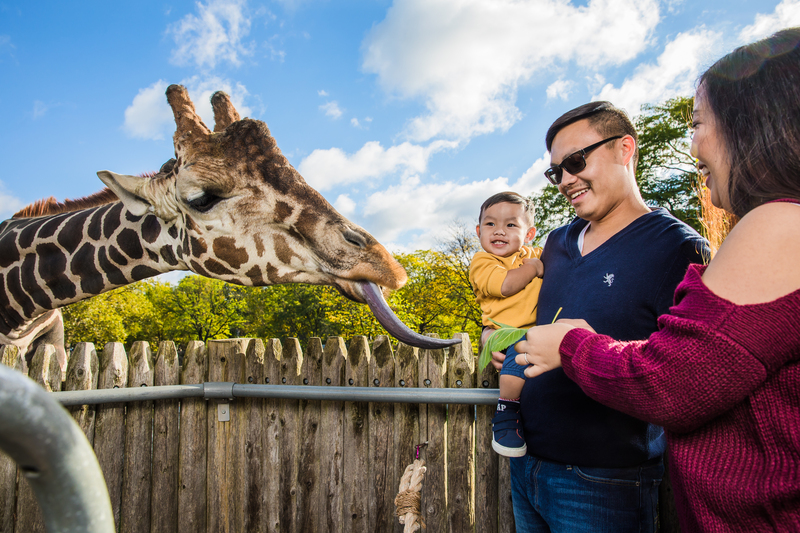 The Giraffe Encounter is a lot of fun for guests, and, we presume, for the giraffes as well, but we cannot be sure. Led by Dr. Matt Heintz, animal welfare research associate for the Detroit Zoological Society, we utilized behavior, IRT and hormone data to learn more about the giraffe’s side of the experience. During this public feeding opportunity, the giraffes receive browse (natural vegetation) from the animal care staff and from Zoo visitors. Based on the data, the feeds are indeed a positive experience, but do not appear to be socially motivated. The amount of engagement we saw in the behavioral data, along with a lack of change in cortisol levels – which can tell us if an animal is experiencing stress – and increases in body temperature reflective of stimulation, all point to an enjoyable event for the giraffes. We also measured levels of oxytocin – a biological marker that increases during positive social experiences – and saw no such increases. This leads us to believe that for the giraffes, the feeds are an enjoyable way to score some extra greens, but not because they get to interact with us. It is important that we ask questions about the perception animals have of their world and any impact we may be having on their welfare. Science is contributing to improvements in animal welfare and one of CZAAWE’s goals is to expand that knowledge and share it to help ensure the well-being of animals living in the care of humans.